This summer, a friend called in a state of unhappy perplexity. At age 47, after years of struggling to find security in academia, he had received tenure. Instead of feeling satisfied, however, he felt trapped. He fantasized about escape. His reaction had taken him by surprise. It made no sense. Was there something wrong with him? I gave him the best answer I know. I told him about the U-curve.Not everyone goes through the U-curve. But many people do, and I did. In my 40s, I experienced a lot of success, objectively speaking. I was in a stable and happy relationship; I was healthy; I was financially secure, with a good career and marvelous colleagues; I published a book, wrote for top outlets, won a big journalism prize. If you had described my own career to me as someone else’s, or for that matter if you had offered it to me when I was just out of college, I would have said, “Wow, I want that!” Yet morning after morning (mornings were the worst), I would wake up feeling disappointed, my head buzzing with obsessive thoughts about my failures. I had accomplished too little professionally, had let life pass me by, needed some nameless kind of change or escape. "has reached his professional goal but feels depressed and unappreciated. He blames his job or his wife or his physical surroundings for imprisoning him in this rut. Fantasies of breaking out begin to dominate his thoughts. An interesting woman he has met, another field of work, an Elysian part of the country—any or all of these become magnets for his wishes of deliverance. But once these objects of desire become accessible, the picture often begins to reverse itself. The new situation appears to be the dangerous trap from which he longs to take flight by returning to his old home base and the wife and children whose loss suddenly makes them dear." This is not a bad description of how I felt in my 40s. All praise to Sheehy for her insight. Note, however, the element of disapproval that creeps in as “wives stand aghast.” Society stands aghast, too. Almost as soon as it was born, the social narrative of midlife crisis took on connotations of irresponsibility, escapism, self-indulgence, antisocial behavior. Wethington, the Cornell psychologist, found in research she published in 2000 that about a quarter of Americans reported experiencing a midlife crisis, and that many who disclaimed the notion regarded midlife crisis as a lame excuse for behaving immaturely. The term crisis also contributes to the stigma, because it suggests a shock or disruption or loss of control, when the evidence points to something much more like an extended and unpleasant but manageable downturn. “When I give lectures, I say we’re stuck with this,” Andrew Oswald told me, “but at least you know it’s completely normal if you’re feeling low in your 40s.” He adds: “And when you’re low, you blame the wrong things.” People thrash around for explanations, which can lead to attribution errors and bad decisions. And those, of course, can bring on what really is a stereotypical midlife crisis, complete with lurching change and ill-judged behavior. In my late 40s, my own nameless dissatisfaction, like a parasitic wasp searching for a host, fixed upon my career and pestered me with an unbidden and unwelcome but insistent urge to quit my magazine column--today, right now, what was I waiting for? Fortunately my better judgment and my friends stopped me from acting on what would have been a useless and self-destructive whim. Still, in hindsight, I wish I had been forewarned that the U-curve, not my column, was the likely source of my discontent, and that a lot of other people, and possibly also a lot of other primates, were in the same boat. 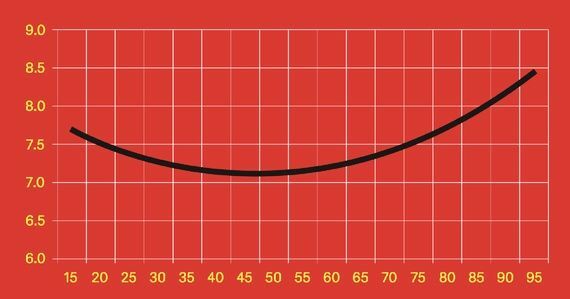 The apes’ well-being bottomed out at ages comparable, in people, to between 45 and 50—implying that the happiness curve is not uniquely human.